Andy Stearns is the owner of My Lucky House. Andy has a passion for real estate and property management and has been managing houses for over 15 years. He loves to fix and remodel homes and has been a General Contractor since 1998. Andy is a licensed Broker and has curated a great team of professionals to serve you with all your real estate needs. My Lucky House has been active in the Bend Chamber of Commerce since 1997. The company joined the Redmond Chamber of Commerce in 2016 and are members of the Downtown Bend association and Visit Bend. We have a personal as well as professional obligation to serve our owners and our guests. 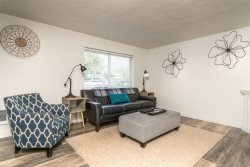 We combine years of real estate and rental experience with an unprecedented level of professionalism to make owning a rental home in Central Oregon an enjoyable and profitable venture. Our team of additional professionals including grounds care and housekeeping understands that a major key to success. We will protect you and your investment with a local, highly trained professional staff possessing the highest commitment to professional, moral, and ethical practices. Because we employ professional staff—rather than contract— we are able to respond immediately to all our guest's concerns and homeowner needs. We do extensive and continual marketing research and training to offer our guests and homeowners current and accurate market rates to ensure our guest are getting the most value for their money and our homeowners are getting the best possible return for their investment in today's competitive vacation market. My Lucky House offers its homeowners a unique online marketing network with full-time staff managing all advertising, web presence and social media. With our commitment to customer service and an innovative online marketing strategy; our homeowners can enjoy a marketing platform that will reach millions of potential renters each year—maximizing rental potential. We are committed to professionally maintaining your home We provide superior cleaning and routine maintenance services upholding our commitment to customer satisfaction. We manage and control all forms of access to your home, in order to prevent unauthorized guests and protect your investment. We are committed to providing a superior management program by having a professionally trained staff conducting business with the owners and the guests. We handle all aspects of the rental contract, confirmation correspondence, directions, welcome packets, and payment processing. As an owner, you will receive a detailed monthly revenue report and owner payments by the 10th day of each month for the prior month's rental activity. We will prepare tax forms to comply with local and state laws. We work hard to keep our fees competitive. Currently, we adjust our fees to the type rentals. Please call us at 541-815-8200 or email us at [email protected] for your complimentary property evaluation. Annual deep cleaning of your home is required (not included in management fee), to maintain the property’s first class condition and ensure our guest complete satisfaction with their stay. This will include professional carpet cleaning, window washing, and other services as necessary. Extensive or expensive processes will be discussed first before implementation. Routine maintenance and home repairs are covered (up to a pre-set limit). Otherwise, professional repairs and equipment replacement is not covered under the property management fee. These services are available at additional costs to the owners and will be pre-approved by you. Marketing and advertising of the property. Adjusting rental rates and discount rates throughout the season to ensure maximum occupancy time and maximum rental income comparable to the competition. Coordinating and collecting any legal documents and rent payments from guests. Providing each homeowner with monthly reports of their rental proceeds. Schedule and conduct cleanings and detailed inspections of the property before and after each guest. Coordinating and managing all guest and contract workers access to the property. Provide guest with additional housekeeping and concierge services when requested. Preparing and paying any lodging taxes. Managing the merchant fees for credit card transactions (shared with owners). Providing an emergency contact number that is monitored 24/7. Providing local staff to assist with any issues that may arise. Communicating with our homeowners regularly. Notify the owner of any immediate emergencies any/or extensive needs. Communicating in a timely manner all issues that fall outside of our rental management contract and daily responsibilities that may require an owner authorization and/or may affect rentals. Providing an accurate rental insurance policy to cover the home, its contents, and the occupants. Providing MyLuckyHouse Inc with a fully functional home that is in rentable condition. Home Owners are responsible for providing repairs or replacements on any items and inventory resulting from normal wear and tear. All damages, repairs, and or inventory replacement resulting specifically from a guest are paid by the guest. In addition to our dedication to customer satisfaction and a solid marketing strategy, we offer a wide variety of professional real estate services to our homeowners and guests. We would like to be your choice for the management of your investments. We encourage you to contact us by email or phone at 541-815-8200, so we can get to know you better.